I have always been fascinated by art glass of all kinds ever since I visited a glass blowing factory in Murano, an island in Venice, Italy, as a teenager on a school trip. 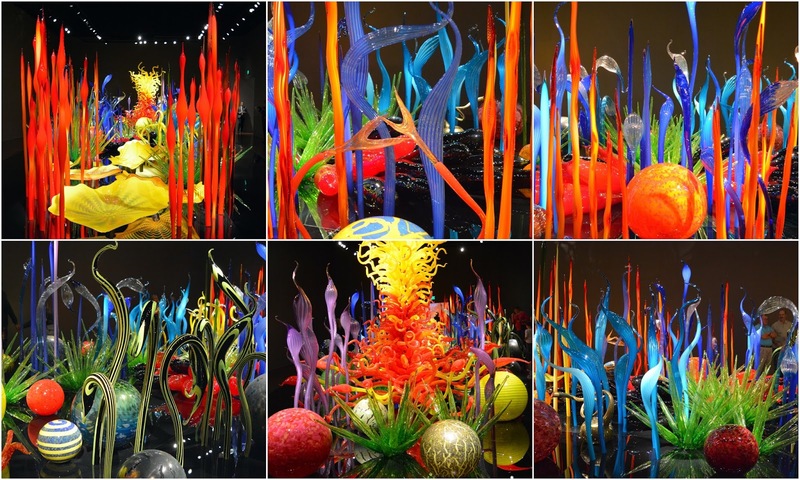 Over the years I became familiar with Dale Chihuly's beautiful studio glass sculptures after seeing his large and colorful art glass pieces on display through visits I made at the Corning Museum of Glass in upstate New York, the de Young Museum in San Francisco, and the Museum of Fine Arts in Boston. In fact, Chihuly's glass works are part of over 200 museum collections world wide, plus as part of the decor of many diverse public venues and gardens, and continue to gather critical aclaim. A few years ago I was fortunate to visit a magnificent outdoor exhibit of Chihuly art glass exhibit at the Denver Botanic Garden. It was the Rocky Mountain's regions first major exhibit of his work, and a wonderful success for the garden. You can read my blog post about this wonderful exhibit on this link. 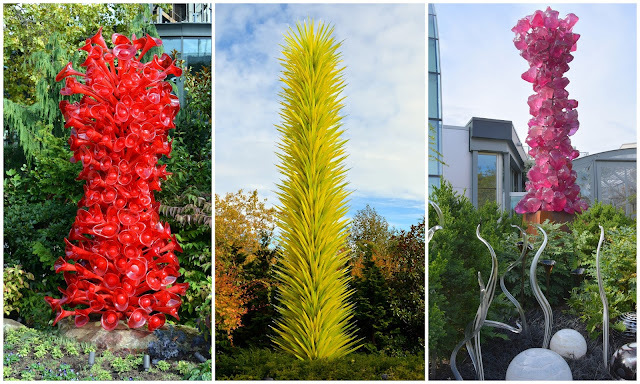 So when my husband and I took a trip to Seattle, Washington, last autumn to celebrate our anniversary, I was excited to finally be able to visit the Chihuly Garden and Glass exhibit located at 305 Harrison Street at the Seattle Center. The 74 acre (30 ha) Seattle Center was originally built for the 1963 World's Fair and is an arts, educational, tourism and entertainment center in Seattle, Washington. It is home to the iconic landmark 605 foot (184 m) tall Space Needle tower, and the Chihuly Garden and Glass, which opened in 2012, which is located next to the tower. 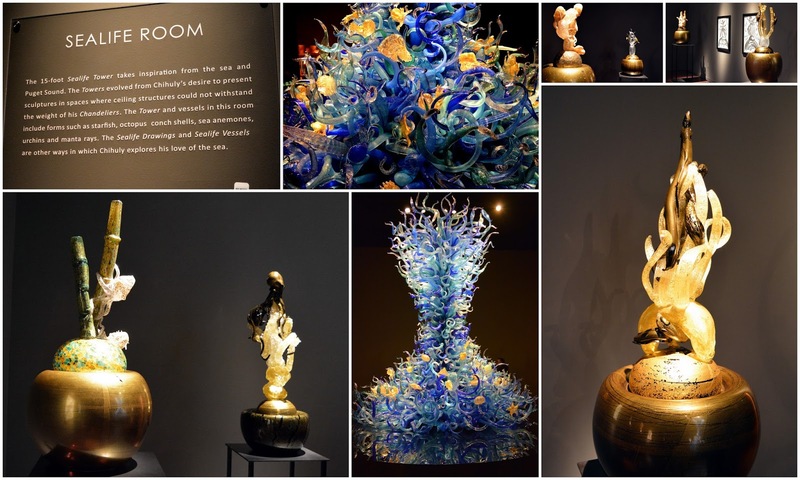 After paying admission and entering the exhibit, you will see a series of panels that tell the interesting chronological story about Dale Chihuly's development as an artist. Born in 1941, in Tacoma Washington, he was introduced to glass while studying interior design at the University of Washington. He went on to study glass at the University of Wisconsin and the Rhode Island School of Design, In 1968 he received a Fulbright Fellowship and went to work at the Venini Glass Factory in Venice, where he learned the team approach to blowing glass, which is critical to the way he works today. In 1971, Chihuly cofounded the Pitchuck Glass School in Washington State, which helped develop glass as a fine art medium. The exhibits in the museum show a chronological significant series of his works in a comprehensive collection displayed in eight galleries and three Drawing Walls. The first work seen is called "The Glass Forest" and was a collaborative effort in the early 1970's. The audio tour of the Chihuly Garden and Glass is online, and I will link each section of what I saw and photographed to their tour. You can listen to the audio description to the Glass Forest here. 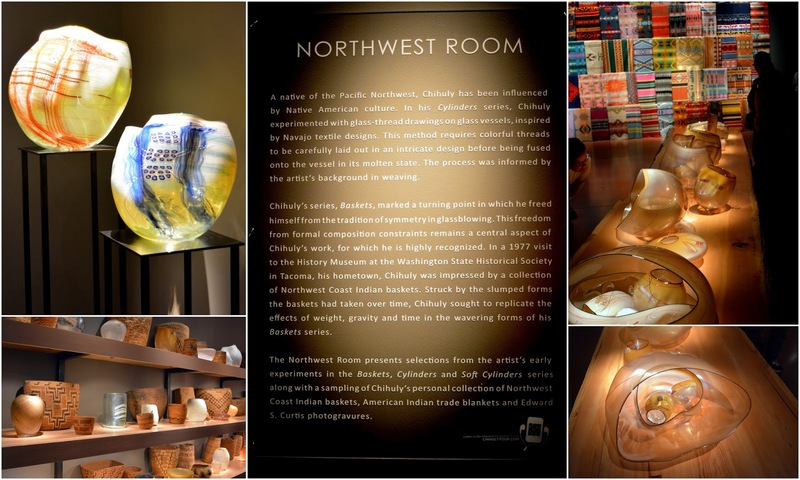 Chihuly was fascinated by Native American baskets and blankets and he began to represent this native work with glass vessels. To learn more about the objects in the Northwest Room here. Growing up in the Pacific Northwest, Dale Chihuly has a love of sea life and had a desire to show sea creatures moving in a glass medium. To listen to more about the "Sealife Tower," click here. The Persian Ceiling. A plethora of bright and colorful hues ofswirling glass To listen to Dale Chihuly talk about this creation click here. Looking up to the top of the Persian ceiling room. It's an amazing feeling to look up at all those backlit colors and see them reflected on the floor! Chihuly said he was inspired by his mother's beautiful garden when he was growing up. This large sculpture filled an entire room. It was entitled "Mille Fiori," which means "A Thousand Flowers" in the Italian language and represents his mother's garden. As you can imagine this was my favorite work in the museum! My husband and I spent quite a bit of time strolling around this exquisite work, noticing new elements in it each time. Photos really don't do this large and beautiful exhibit justice, but I tried to photograph as much of this work as I could to show you as much of its elements as I could. 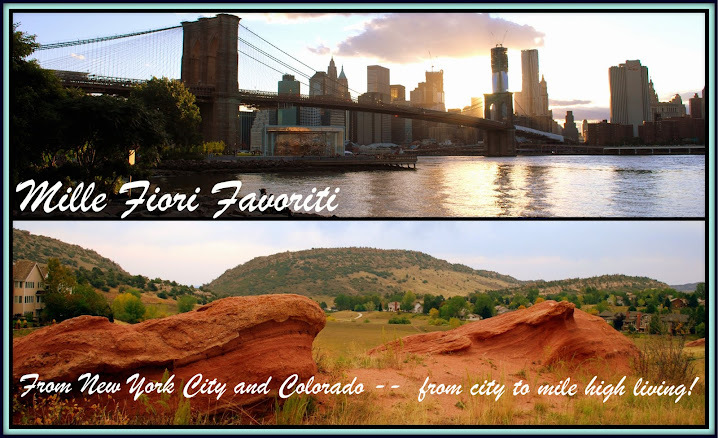 You can listen to the audio tour description of Mille Fiori here. 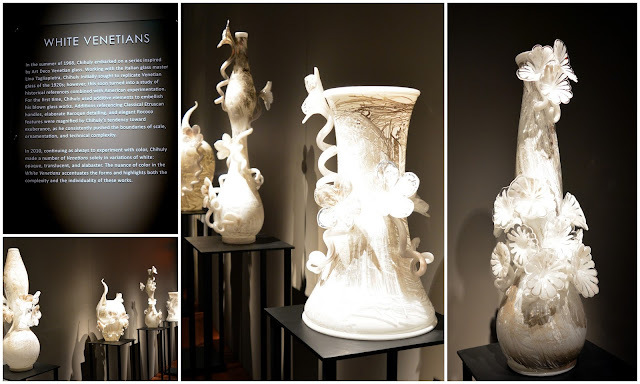 In contrast to the colorful Mille Fiori sculpture, Chihuly next wanted to experiment with shades of white, alabaster, opaque and translucent glass, and he created this series of works called the "White Venetians." If you click on to enlarge this photo you can see the translucent details within this glass sculpture. Truly exquisite! The Chandelier Room was filled with what are now iconic Dale Chihuly chandelier sculptures in all shapes and colors. I have seen chandeliers like these in many places over the years, including the Borgata Hotel and Casino in Atlantic City, New Jersey--click here--to see that post, and the Ellie Caulkins Opera House in Denver--click here --to see that post. They are always spectacular and almost seem alive with all the individual pieces of glass that make up their components. The detail in the pieces are amazing. To listen about the Chandelier Room click here. 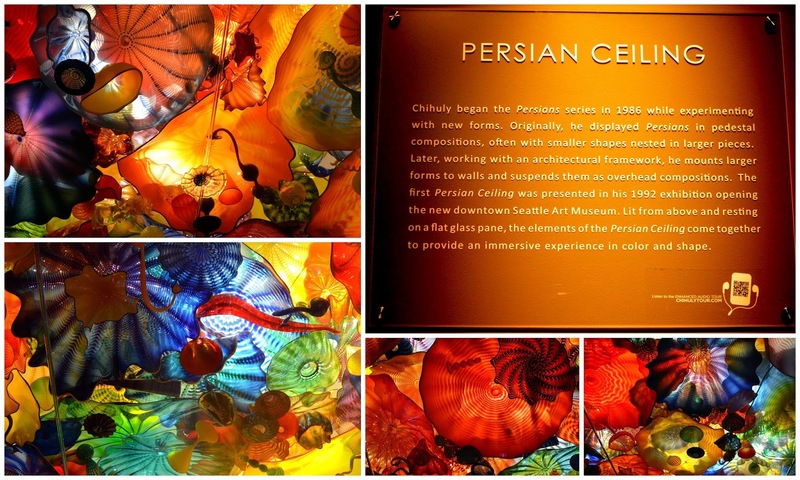 The Macchia Room was inspired by new glass stain colors that Chihuly discovered in Germany. The pieces are lined with white glass that left a spotted impression that Dale decided to call "macchia," which means "spotted" in Italian. To hear more about these flower like sculptures click here. 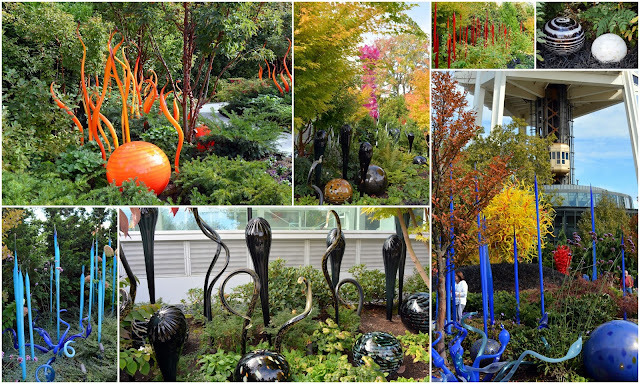 The Glass House exhibit is the cornerstone of Chihuly Garden and Glass. It is a 40 foot tall glass and steel structure covering 4,500 square feet (418 m), called the "Glasshouse." 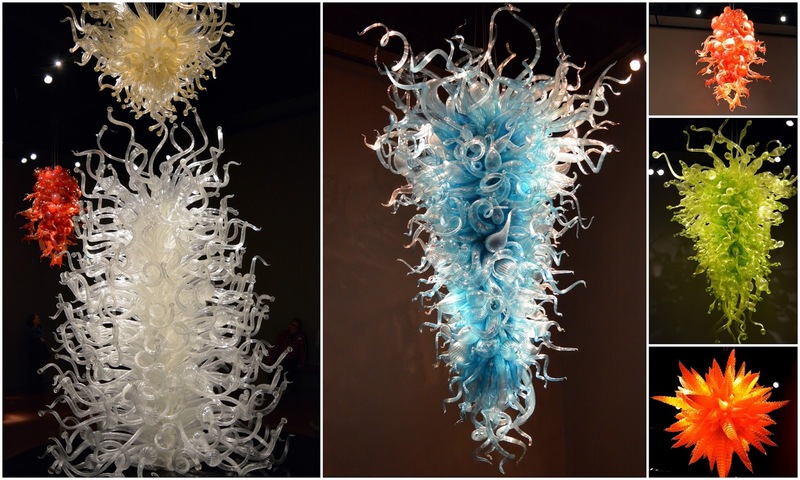 Hanging from the top is one of Chihuly's largest suspended sculptures. The artworks vibrant autumn hued colors are ever changing with the light that flows into the glasshouse. Looking up from the center of the glasshouse we could see a view of the Space Needle standing outside. To listen to more about the glasshouse sculpture click here. 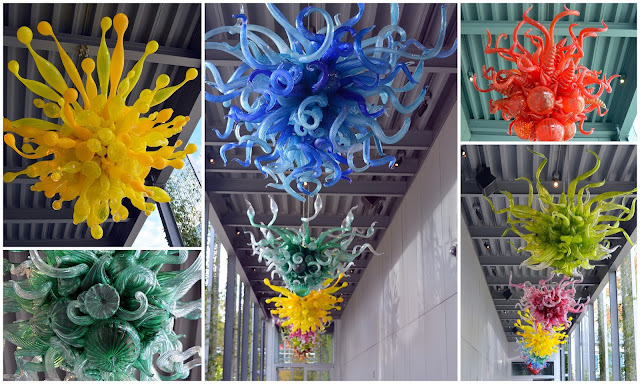 Outside, leading into the garden exhibit, there was a corridor of Chihuly chandeliers hanging along a ceiling overhang. They looked like bright and dazzling flowers! The entire Garden exhibit is about 26,000 square feet (2,415 m) in size. It has winding paths that bring one around the various gardens composed of live trees, shrubs and flowers along with the incorporated glass sculptures that are in different hues. This sculpture close to the Glasshouse is called the "Yellow Sun." Look at how many pieces make up this amazing sculpture! The autumn colors of the trees during our visit added to the overall beauty of the exhibit. ...while others looked like pieces from a mystical fantasy! ...as well as imposing ethereal towers of glass! 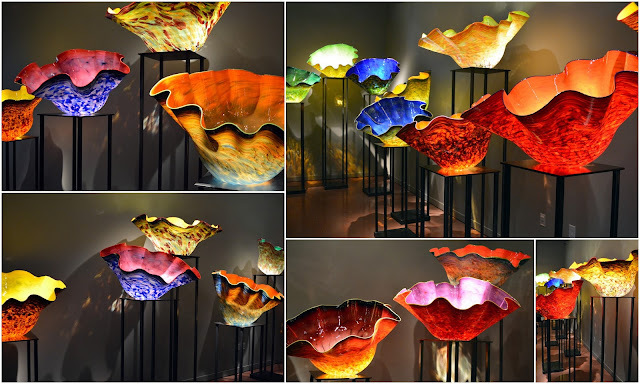 If you'd like to see videos about some of the other Dale Chihuly exhibts click here to see the video page on his official web site. I was so happy to have had the opportunity to visit the Chihuly Garden and Glass exhibit in Seattle, Washington to see his magnificent works in all their splendor. 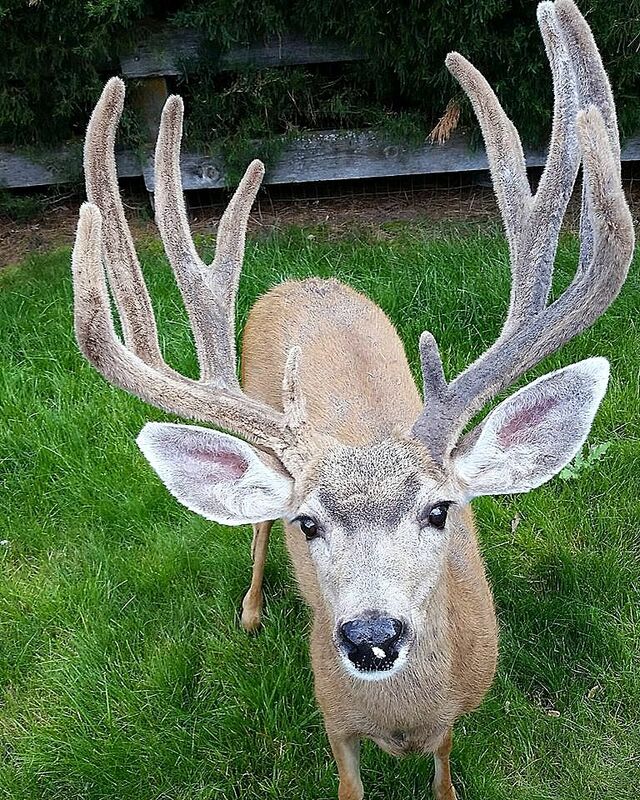 It truly was one of the highlights of our trip! We had a wonderful Easter and Spring is in full bloom here in Colorado. I'll bring you back to our trip to the Pacific Northwest in future posts, but I'd love to show you some historical sights in my own neighborhood on my next post--see you then! 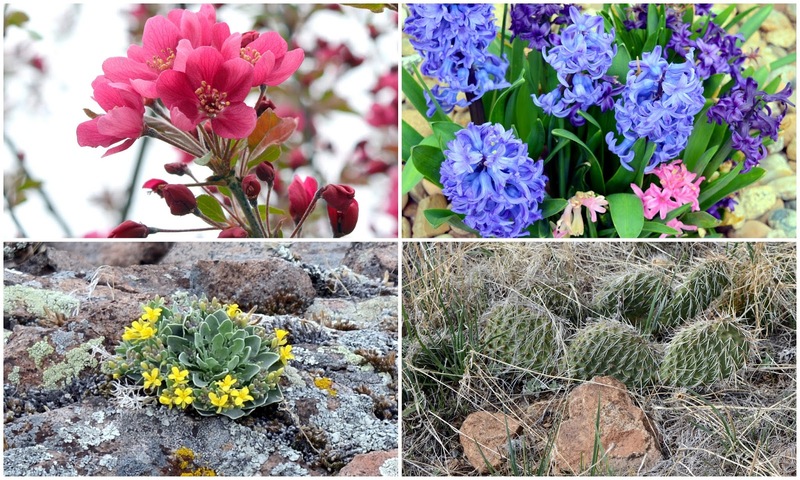 Spring comes to Colorado with days of sunny warmth followed by nights of frost and snow. It is too unpredictable to plant, but the longer hours of daylight still brings flowers to the landscape non-the-less. The trees blossom and bulbs burst forth. The hardy wildflowers begin to bloom and even cacti in the foothills come alive again. 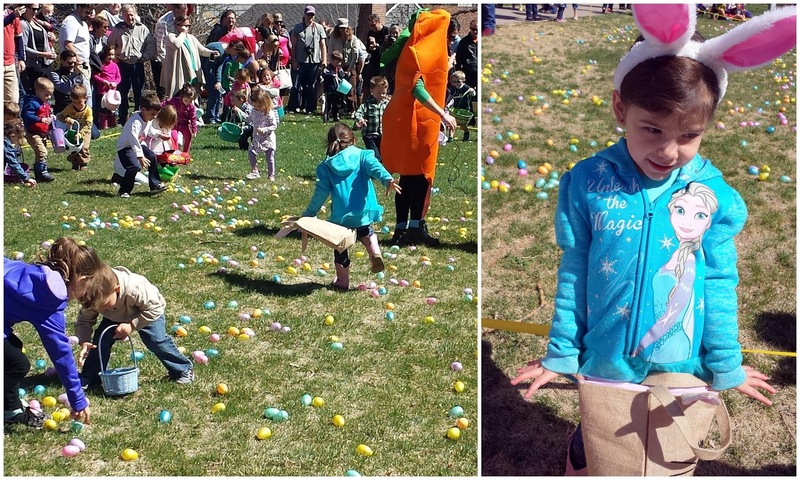 Our community has an annual Easter Egg Hunt every year, so it is always fun to see our oldest granddaughter, who lives near us, attend this event every year. 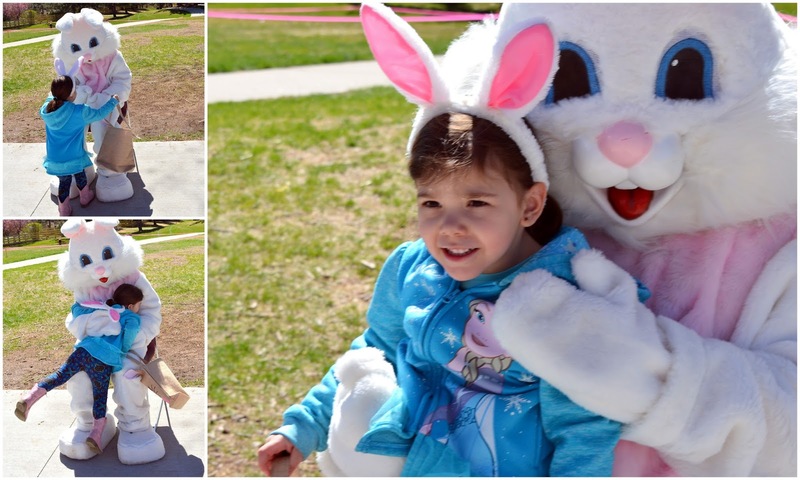 This year she was so excited to see the Easter Bunny she leaped into its arms! Last year--click here to see that post--we had snow on the ground during the Easter Egg Hunt, but this year we had a pleasant day in the high 60's. The beautiful weather brought out many children and there was a wild rush to collect eggs in the two to four year old group. It was very exciting for the little ones! We are hoping we can hold Grandma's and Pop Pop's egg hunt at our house for all our grandchildren outside this year, too, as every year before we had to do it inside. Again, we can not predict what the spring weather will be in April. 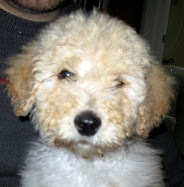 One thing for sure is that I will be busy this week shopping and cooking and preparing for Easter dinner at our house. 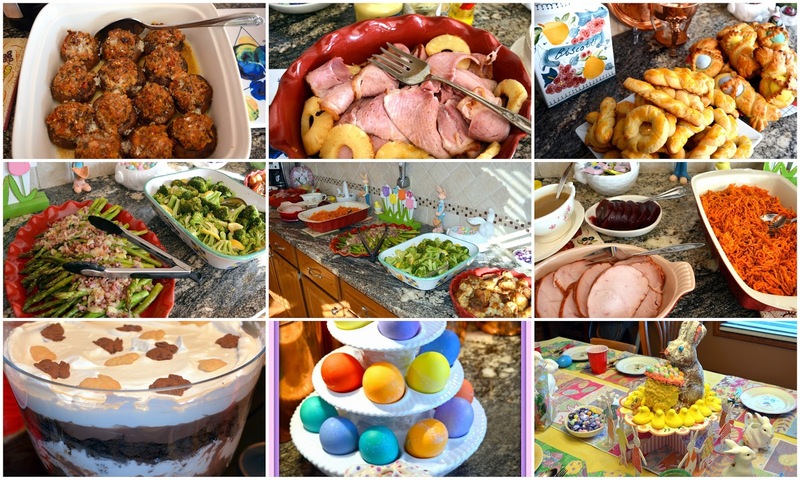 The collage above shows some of the food I prepared last Easter. It is always joyous for our family to celebrate together! Wishing you a very Happy and Blessed Easter! 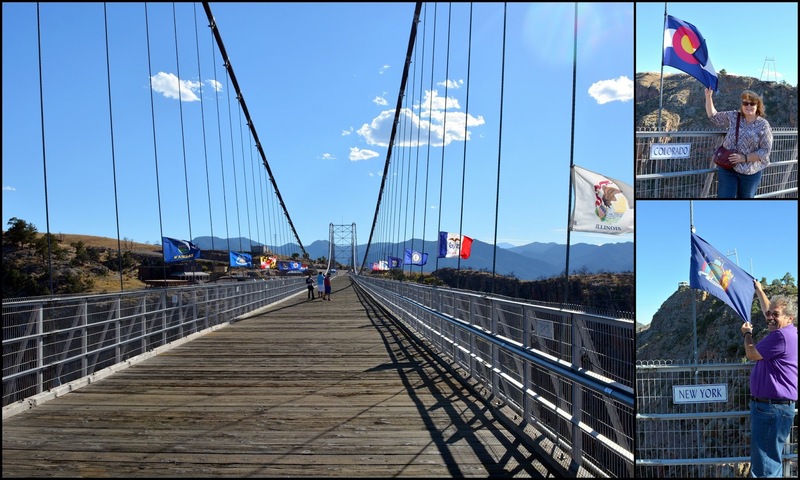 Would you take a walk across the highest suspension bridge in the United States, that crosses a gorge 955 feet high above the Arkansas River in Colorado? A bridge that is only 18 feet wide, composed of wooden planks and spans 1,270 feet from one edge of the gorge to the other edge? If so, then welcome to the Royal Gorge Bridge and Park located in Canon City, Colorado! 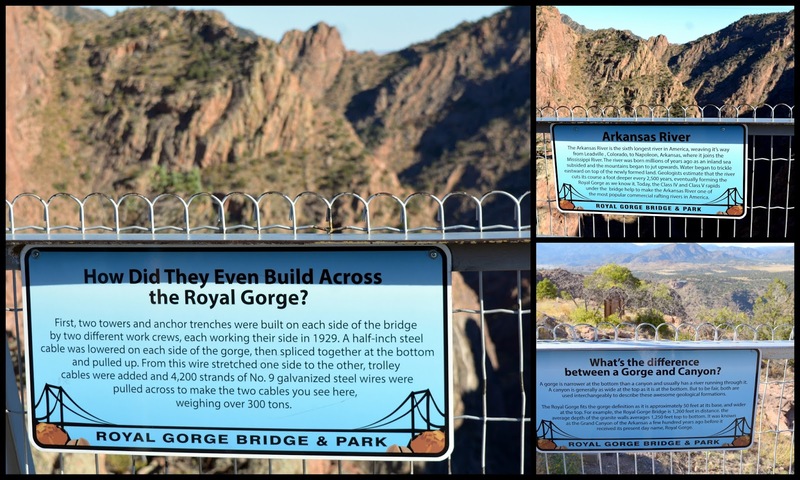 The bridge was built in 1929, by Texan Lon P Piper, as a tourist attraction to give visitors a view of the Royal Gorge. In my last blog post--click here to read--I showed you our visit to nearby Canon City and our ride on the Royal Gorge Railroad that travels below in the gorge along side the Arkansas River. 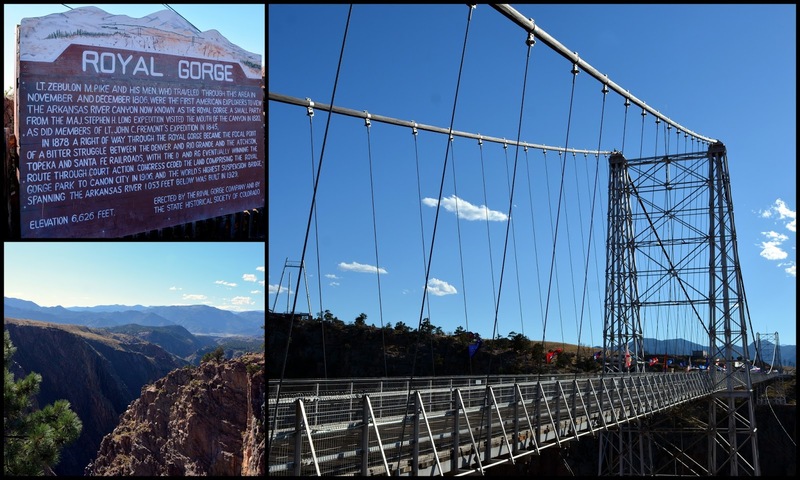 After the train ride we drove to the Royal Gorge Bridge and Park to visit this attraction. 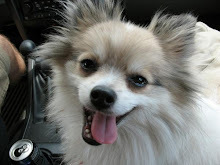 There is so much we want to see and do in our new state, and visiting the railroad and the bridge was high on our list, so we were happy to have a beautiful day to visit both attractions. If you visited this area before June, 2013, you might notice from my photos that many of the attractions that are part of the park look different. That is because there was a devastating wildfire in this area on June 11th, 2013, that destroyed 48 of the park's 52 buildings, plus the aerial tram and the funicular. Fortunately, there was no loss of life and the bridge sustained only slight damage to its wooden deck. The park was rebuilt for a cost of 30 million dollars, and had a grand re-opening in May, 2015. It now has a brand new Visitor's Center, Aerial Gondolas, Water Clock, and a new Cloudscraper Zip Line, which crosses the gorge on the east side of the bridge, the Royal Rush Skycoaster, a new Tommy Knocker Children's Playground, and a new Plaza Theater and Historical Expo. 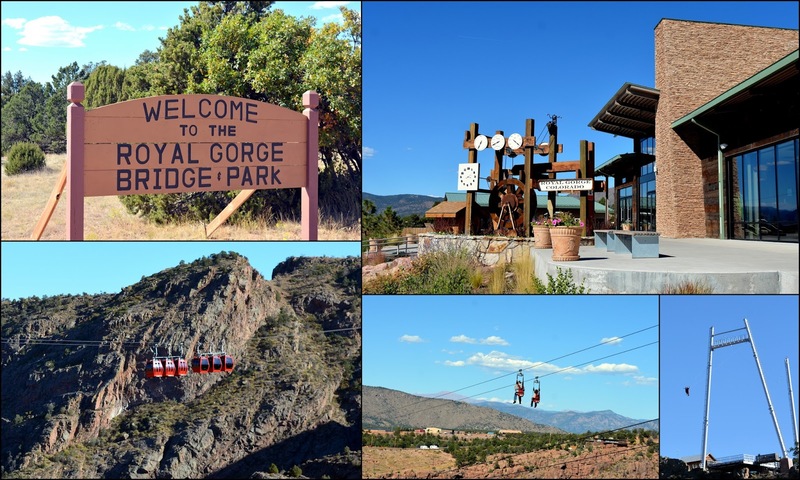 After we paid our general admission fee --some attractions have an extra fee--at the Royal Gorge Bridge and Park's Visitor Center, we took the included gondola ride, that traverses 2,200 feet across the gorge. We planned to walk back to the visitors center by walking across the bridge. The views looking down the gorge from the aerial gondola were astounding! If you take the gondola ride to the south side of the gorge, you will find the walk to the bridge an easy downhill trek with some beautiful views of the Sangre de Cristo Mountain Range in the distance. You also get more views of the deep 1,200 foot gorge. The bridge and the incline railway were listed in the National Register of Historic Places in 1983, and underwent extensive renovations between 1980-84 where new cable anchors and suspension rods were installed to stabilize it. Usually there are no cars allowed to cross the bridge, except for an occasional car club that prearranges a scheduled ride. My husband and I began our walk across the bridge feeling very safe. It was somewhat windy, but the bridge felt steady and secure. There were interesting informational placards along the walls of the bridge to read--click on to enlarge. We were visiting late in the afternoon, so there were not many people on the bridge, and we were able to take our time to look at all the sights. We noticed there were small gaps between the wooden planks that line the bridge, and if you looked carefully you could see all the way down to the river below! We could see the 100 or so new plank boards that had to be replaced after the wildfire. It was miraculous that the bridge survived when 90% of the surrounds burned! The Royal Gorge Bridge is lined with all the 50 state flags of the United States, and my husband and I took photos of both New York, our original hometown state, and Colorado, our new one! Our favorite thing to do on the bridge, of course, was looking down at the amazing views! 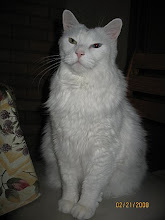 Click on the photos to see them enlarged to see the Arkansas River which begins near Leadville, Colorado and flows eastward all the way to the state of Arkansas and into the Mississippi River. The river is estimated to cut the gorge lower one foot every 2,500 years. 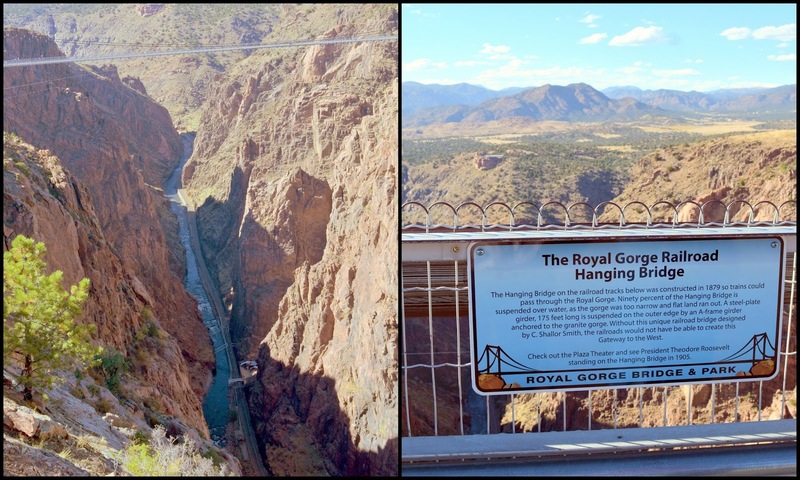 If you click on this photo collage to enlarge it, you can see an engineering feat for the Royal Gorge Railroad below, called the hanging bridge. In 1878 when the Denver and Rio Grande Railroad was building this line they found one portion of the gorge narrows to 30 feet width. The railroad would have to travel over the river at this point and a 175 ft plate girder suspended on one side by "A" frame girders spanning the river and anchored to the rock walls. Towards the end of our walk, at the north side of the bridge, we could see the new cables that now anchor the bridge, plus wind cables underneath. Visitors who traveled across the bridge before this work was completed in 1983 said the bridge would sway in high winds. Now it feels very secure. A placard explaining how the Gorge earned its "royal" name. The ruins of the funicular--the incline railroad-- that once brought visitors to a platform at the bottom of the gorge. It was damaged in the 2013 fire and as of now there are no plans to rebuild it. We really enjoyed our visit to the Royal Gorge bridge and Park and all the sights we saw there. 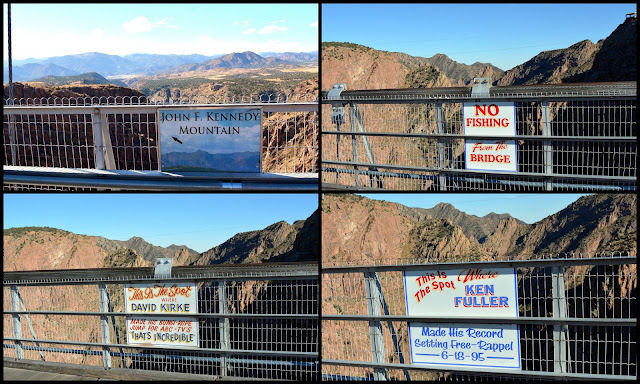 Now we are part of the many millions that can say they walked across the high suspension bridge in the United States! Before I finish this post, I have to show my youngest grandson's recent 6th birthday party! 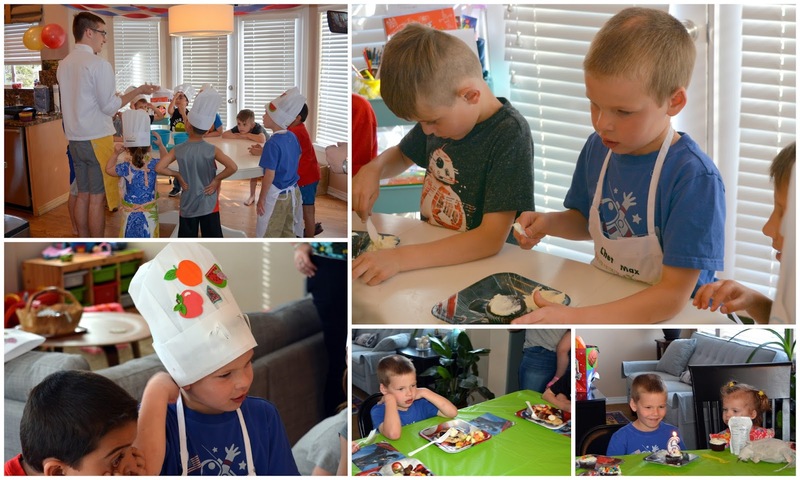 He wanted to have a "cooking party" and so a young chef came to his house to teach my grandson and his friends how to make ricotta pancakes and a fruit salad, and also how to decorate their cupcakes. The boys really enjoyed eating their creations, and we had one very happy birthday boy!